We received the following announcement concerning a celebration of the Vigil of Pentecost which will take place at the church of St Anthony in Jersey City, New Jersey. 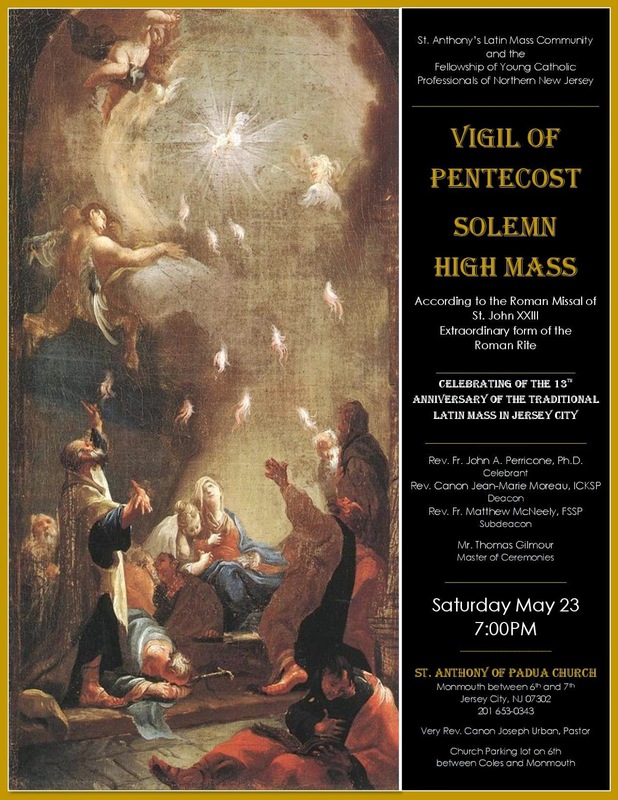 Mark your calendars for a truly “Extraordinary” event...on the occasion of the 13th anniversary of the return of the Traditional Latin Mass to Hudson County, New Jersey, a Solemn Mass will be sung on Saturday, May 23rd at 7:00 p.m. for the Vigil of Pentecost, at downtown Jersey City’s historic St. Anthony’s Church. (Located on Monmouth Street between 6th and 7th Streets). Diocesan clergy from throughout New Jersey, as well as priests of both the Institute of Christ the King and the Priestly Fraternity of St. Peter will participate as ministers at the altar. The renowned Cantantes in Cordibus choir, under the direction of Maestro Simone Ferraresi, will perform Haydn’s acclaimed Missa Brevis Sancti Joannis de Deo. The organizers of this truly special event are the many young parishioners who have recently joined the growing parish in a quickly gentrifyng city. They hope that this will be an opportunity for young faithful Catholics to worship, meet and network. Maestro Ferraresi studied at the Conservatory of Music in Ferrara, Italy, where he earned his degree with highest honors; at the Academy of Music and Performing Arts in Vienna he studied with world renowned pianist and musicologist Paul Badura-Skoda. Maestro Ferraresi specialized in interpretation of classical composers; at the Royal Academy of Music in London, where he was awarded the Diploma of the Royal Academy of Music – the highest examinable award given by the Royal Academy. He was also awarded three special prizes for best performance in the final recital. He is the founder and artistic director of the Ferrara International Piano Festival. St. Anthony’s Church is listed on the State and National Registers of Historic Sites. The church, built in the Victorian Gothic Style, is a pristine example of a church untouched by modern elements and remains a true example of Roman Catholic aesthetic rarely seen today. (See http://stanthonyjc.com/#/photo-gallery/4537929714.) The church parking lot is located on 6th Street between Coles and Monmouth Street and is easily accessible from the Grove Street PATH, the Newport PATH and Light Rail stop. There will be a celebratory coffee served after Mass as well as a visit to a local establishment for the young people in attendance.